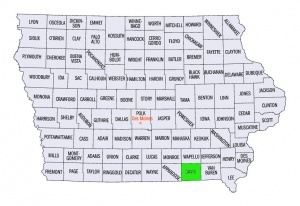 Amish Mennonites settled in this southern Iowa county in 1854. In 1892 their one congregation, Pulaski, became affiliated with the General Conference Mennonite Church (today part of Mennonite Church USA). In 2007 it had 116 members. Gingerich, Melvin. "Davis County (Iowa, USA)." Global Anabaptist Mennonite Encyclopedia Online. 1956. Web. 22 Apr 2019. http://gameo.org/index.php?title=Davis_County_(Iowa,_USA)&oldid=119188. Gingerich, Melvin. (1956). Davis County (Iowa, USA). Global Anabaptist Mennonite Encyclopedia Online. Retrieved 22 April 2019, from http://gameo.org/index.php?title=Davis_County_(Iowa,_USA)&oldid=119188. This page was last modified on 12 April 2014, at 05:48.